When Marko unleashes one of his giant Marvel cover montages like this, I want to send a proactive email to my LCS stating if the House of Ideas ever has Djurdjevic do interiors - I want in. So far he's done these giant interlocking cover images for Daredevil, Avengers, Spider-Man, The X-men, Iron Man and the latest just below puts the same finishing touches on Wolverine. 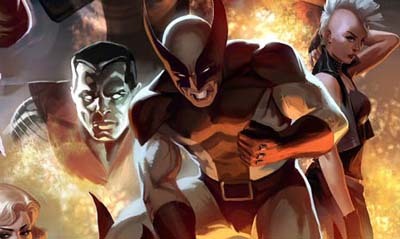 Forget Warcraft 'WoW' here stands for 'World of Wolverine' (click to enlarge). While it's good seeing Omega Red back in the picture, the highlight for me is the far right, with Logan in his brown and gold set of duds - I still don't think that getup has ever been beaten, and looks flat-out mean. Plus if that ain't one of the best versions of Havok ever to see print, I'll eat my hat - Havok coat-hanger themed headpiece included. Cant never get enough of Marko's work..
Talking of his work. i had a post of him and his company SIXMOREVODKA's portfolio he released for free. If you havent checked it out i am sure u will love it. Hey IFF - Sorry I thought I left a comment on that post after I downloaded the portfolio? It sure is pretty sweet, actually the SIXMOREVODKA brand itself is pretty sweet too. Very nice stuff. I see he's going to be on Discovery Channel here soon too so will have to give that a watch when it get's here. What documentary will it be about?..i am curious and want to watch it. good stuff! his style reminds me of the Hillderbrandt bros. but a little heavier on the shadows. Will deffinitely check out that link you posted above. Sounds great! Good call David - I can see the Hilderbrandt Bros in his work now too! to Obi-wan you listen. see now the Hilderbrandt style, save you it can!